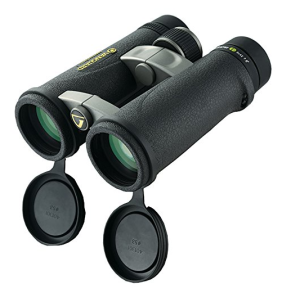 Endeavor ED from Vanguard is a premium choice binoculars for bird and nature watchers everywhere – and with good reason. There are four models of the Endeavor ED binoculars: the 8×42 or 10×42 (your more traditional choices) and the 8.5×45 or 10×45 (the larger options). All models are available in camouflage, which is very convenient. Vanguard has been manufacturing quality products for 25 years. They originally introduced a line of camera and photography accessories. But they eventually began offering sports optics like lenses and binoculars. As far as the Endeavor goes for root prism binoculars, the physical design is pretty straightforward and similar to other comparable models. The eyecups are able to extend fully and hinge open. The weight charts in at just above average for binoculars of this class. Plus, the Endeavor Ed seems to be designed quite ergonomically. So when you hold it in your hands, it feels natural and sturdy. The open bridge design of the Endeavor ED seems to be one of its more exciting features. This allows you to have two fingers between the hinges – sometimes three for extra stability while holding them. The Endeavor EDs are O-ring sealed and nitrogen-purged, so they are waterproof and internally fog-proof, which is a great feature if you’re bird or nature watching in a humid environment. One negative aspect of the design that stuck out to us was that the Endeavor’s interpupillary distance range is 58-74mm. This means that most people should have no issues finding a range that works with their eye width. However, if you have particularly close-set eyes, you may have some difficulties finding a range that’s comfortable. The exterior of the binoculars is a comfortable feeling faux leather material. Underneath the lens barrels there are cutaways (or divots), which give your thumb a naturally comfortable place to rest while the binoculars are in use. All in all, Vanguard’s Endeavor ED is a comfortable and sturdy set of binoculars that should be a good fit for the majority of people. In regards to the optical fields, depending on the size/model you’ve purchased, the Endeavor’s range will be average to fairly above average. Eye relief seems to also be above average but across all models. We also found the focus knobs to be rather sensitive but in a good way; the focus mechanism was still securely stiff and not too loose – as can be the case with other focus-sensitive binoculars. That way, the Endeavor is great for finding the ideal focus quickly and without inadvertently clicking past it. Vanguard has designed the Endeavor with phase-coated BAK-4 prisms. An anti-reflection AR coating is also featured on every air-glass interior for efficiency in light transmission and image quality. In order to improve contrast, the Endeavor is also designed with a V-Max Silver coating for a sharper image; plus, the binoculars feature an emerald coating to make the green spectrum pop while viewing. The Endeavor’s glass itself seems designed to decrease chromatic aberration. Speaking more to the binoculars’ adjustments, the Endeavor’s eyecups are able to adjust by using the helical twist mechanism. This takes the eyecups through two different positions: up and down. Even though these positions weren’t marked, the eyecups were still stable when adjusted. The right hand side of the binoculars features the diopter adjustment. It can adjust through 4 or more clicks in either direction of the midpoint. What we found truly interesting is that it’s featured in a product priced as reasonably as the Endeavor ED.